This is Part 2 of our report on the EDAC Executive Vision meeting, focusing on the business-related questions. In Part 1, we covered the discussion of the more technology-specific questions. Where will the majority of advanced designs be done in 5 years? The panel was unanimous in predicting that most advanced designs would continue to come from North America in five years. A smaller majority, ~70% of the EDAC population agreed, with ~25% choosing China, and ~5% seeing a shift to Europe. The question is too chip design specific, said de Geus. Much system design, he pointed out, occurs in Europe. Segars said that ARM is seeing greater than 50% of of their business from Asia-Pacific, compared to 20% a few years ago, but 5 yrs is not long enough to change. Tan bemoaned immigration issues, saying that foreign students are being forced to go back home after completing their college education in the U.S. In ten years it will be very different, he predicted. Who will drive the IC industry in 5 years? The choices for this question were Foundries, Big Chip Companies, Systems Companies, Software Companies, IP companies, or Fabless companies. The implication that "Big Chip" companies cannot be fabless is inconsistent with the current state of the industry, with fabless companies such as Qualcomm and Broadcom long established in the Top-10 in terms of semiconductor revenues. Nevertheless, three of the panelists chose system companies, one chose fabless companies, and one chose software companies as the leaders of the IC industry in 2017. There was general agreement by the EDAC population on system and software companies as first and second ranked influencers in five years, respectively, with a relatively even spread across each of the other cateogries, except for fabless - which was not chosen by any of the EDAC population. Rhines said that systems companies have always driven the industry, since they buy the ICs. Tan once again pointed to Facebook as a powerful influencer of the IC industry, as he had at the GLOBALFOUNDRIES Technology Conference in 2011. 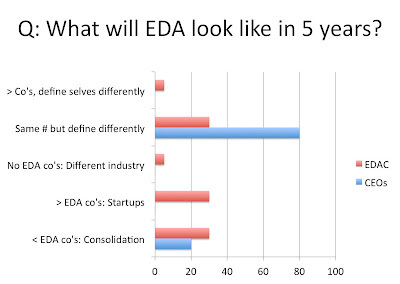 What will EDA look like in 5 years? Four of the five executives on the panel, or 80%, said that there would be the same number of companies in the EDA industry in five years, but that they would be defined differently. Only one said there would be further consolidation, resulting in fewer companies. The EDAC population was split at ~30% each for the three choices: more companies due to startups, fewer companies through consolidation, and the same number of companies but defined differently. The remainder of the responses were split, with ~10% saying there would be more companies, but they would define themselves differently. Another 10% said there would be no EDA companies, that it would be a different industry in just five years. This is the most startling result in the survey. Taken in total, 4 out of 5 of the executives, and 50% of the EDAC population, said that they expect EDA companies (or the industry), to define themselves differently in five years. "the more it changes, the more things stay the same"
Rhines went on to say there will still be an EDA industry, but that companies will need to spread out into other areas, because there will be electronics in every kind of system. Three companies have always accounted for 75% of the industry revenue, he said, and he predicted that will be true for the next thirty years. "will EDA absorb other industries, or will other industries absorb EDA"? Rhines replied that neither would occur, because (for example) EDA would not eliminate mechanical CAD, but there would be more electrical views in the mechanical domain. He also claimed that the EDA industry has grown the number of companies every year, but they just haven't received funding from Venture Capitalists (VC). 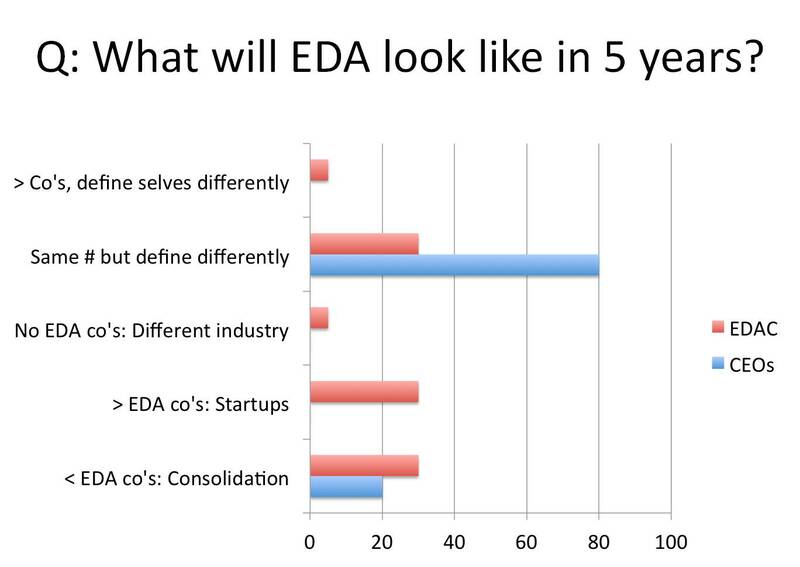 Observers are left to wonder then, why did Rhines not choose "more EDA companies with startups", as his answer for what EDA will look like in 5 years? Tan expressed his perspective as a VC himself, saying that he is encouraged by recent EDA industry growth, and there are a lot of opportunities for more startup companies (like Ed Cheng's Gradient). He left open the critical issue of VC investment for EDA startups, however, saying only "we need to find some way to fund them". But he, also, did not choose "more EDA companies with startups". The boundaries of the (EDA) field are moving into software, and closer to physics, said de Geus. Without providing specific details, he predicted that somehow, EDA and the semiconductor industry together would produce a "100X" improvement in some parameter of electronic systems in the coming years. It may be that the big-3 EDA CEOs foresee themselves being in exactly the same positions in five years. The closest choice to status quo was "Same number of companies", with the qualifier of "but defined differently". Given this survey question response, we attempted to get more insight on the EDA CEO's strategies, by asking how they planned to redefine their companies in the next five years. With time running out for the meeting, only Synopsys' de Geus responded. "What looks different is the engagement with the customer", he said, "because we must be more intimate with customers to help with their challenges." He concluded by saying "We will (gradually) branch out, up, down, and sideways."